Home Client Side Object Model (CSOM) PnP PowerShell PowerShell SharePoint Online SharePoint Online: How to Delete a File from Document Library using PowerShell? SharePoint Online: How to Delete a File from Document Library using PowerShell? How to Delete a File in SharePoint Online? 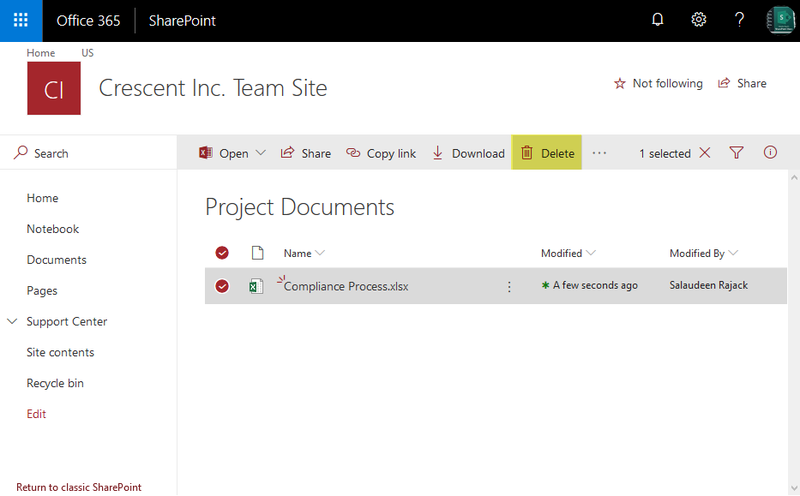 In SharePoint Online site, Navigate to the document library. Select the File you want to delete and Click on "Delete" button from the toolbar. You can also select and delete multiple files! Confirm delete by clicking on "Delete" button in the confirmation popup. You can also hover over the document you want to delete and click on "Delete" from the context menu. You'll find a notification in the top of the document library telling you that the item has been deleted. write-host -f Green "File has been deleted successfully!" This script deletes the file from given URL. There are scenarios where you may have to delete a file using its item id. Here is the another script to remove a document using its item ID in SharePoint Online. This time, lets delete a document from SharePoint Online using its Item id. Write-Host -f Green "File $FileRelativeURL deleted successfully!" Write-Host -f Yellow "Could not Find File at $FileRelativeURL"
This removes the File permanently. Use -Recycle switch to send the File to recycle bin instead!